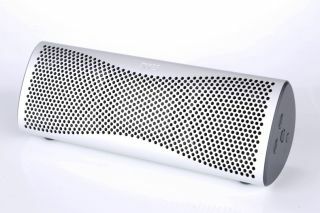 KEF launches Muo wireless Bluetooth speaker | What Hi-Fi? The Muo features a moulded internal enclosure, surrounded by an extruded, curved aluminium shell. Not content with off-the-shelf units, KEF has designed a miniature version of the company's Uni-Q driver, which can be found in the Award-winning LS50 loudspeakers, for the Muo. It uses two 50mm Uni-Q drivers combined with an auxiliary bass radiator. You can position Muo upright or horizontal - a sensor inside the speaker adjusts the sound automatically, depending on its orientation. Muo can also be synchronised to work as a stereo pair or alternatively, the 'Dual Connect' party mode allows you to place them further apart in a multi-room-esque setting. Besides Bluetooth aptX, there's also a 3.5mm auxiliary input for a wired connection, and NFC pairing for compatible smartphones. KEF claims the built-in rechargeable battery should be good for 12 hours of playback. Muo is available in five different finishes: Horizon Gold, Storm Grey, Light Silver, Neptune Blue and Sunset Orange. The wireless speaker costs £299 and is available to buy now. KEF has the X300A wireless desktop speakers in its range, as well as the recently launched KEF EGG wireless system, but prior to the Muo it hadn't previously released a one-box, portable Bluetooth speaker.